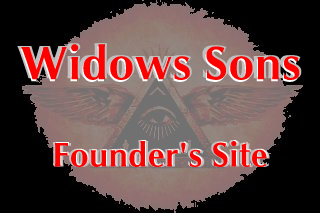 The Widows Sons were founded in 1998 for the purpose of aiding and assisting widows and orphans of master masons. The founding and most foremost purpose is aiding and assisting widows and orphans of Master Masons through a state operated widows fund, or through a Grand Lodge's fund. Aiding and assisting widows was the sole founding purpose, then two years later, the other two secondary purposes were added just before the Florida and Texas Grand Chapters were charted by Army Nunez.. Some chapters also state as their purpose, to introduce Freemasonry to the world of motorcycles and the vice-versa. Brothers, let me tell you, this was the last purpose, and fellowship among masons who ride, which should be automatic, was a very distant second. Please, in order to reflect our true purpose, if your text does not agree with our founding purpose, please adjust the text on your advertising media to reflect our true founding purpose aiding and assisting widows and orphans of master masons. Also, when the Widows Sons were founded, there was never any intention of having any national conferences or any consulting committees or coordinators to advise, council or rule over any Grand Chapter... The Grand Chapter is the ultimate authority in its jurisdiction, and should never have to answer to any group, committee, person or persons other than their Grand Lodge. There was and never will be any intention of having conference calls held by any person or group of persons. Each state was intended to operate according to their Grand Lodge rules, and no two Grand Chapters were intended to be combined, teamed up or unified to set or create any new standards or any new policy for any chapter(s) other than their own chapter. Autonomous was defined as; to operate the Grand Chapter in its jurisdiction under the rules and laws of its Grand Lodge without any outside rulings, consulting or advisory person(s) from out side its jurisdiction. There was never any intention of forming of any type of conference call. I ask you not to support this cleverly disguised concept. These conference calls will give an illusion to those who are forming them, that they have some authority over the rest of the chapters. No intention of any committees or any person(s) joining together to have any more of a voice in the Widows Sons, nor to set any type of law, policy or rules for the Widows Sons, whether it is cleverly disguised in the name of unity or not, it is a violation of the principles of autonomy in which the Widows Sons were founded upon. All authority should remain within the Grand Chapter, without anyone outside the Grand Chapter sharing its authority. Our Autonomy is what makes the Widows Sons what we are. A Grand Chapter should never give up any of its authority. Allowing anyone to call themselves a national coordinator, or regional coordinator or national or regional anything is the first step in losing the authority given by your autonomy. If you give up any part of your autonomy, you have also given the authority that is attached to that piece of autonomy, and you will soon be ruled by that part you gave up. I ask that you keep your autonomy and say good bye to this attempt to create any authorities other than Grand Chapter Authority. The only way you can keep your autonomy, is to keep it within your Grand Chapter. The Widows Sons have been autonomously operated state by state since day one. Allowing any national, regional or international officers, coordinators or consultants to exist is the opposite of autonomy. If you allow these to exist, you no longer have autonomy.